Home Uncategories Amazon Best Sellers Rank! Just wanted to share a little exciting news! At the moment Always You (which has only been out for a month! 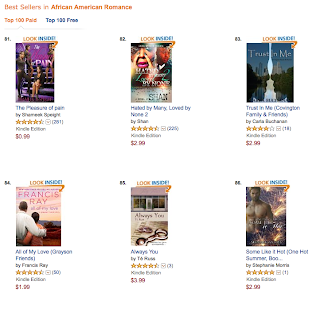 ), is currently number 85 on Amazon's Top 100 Best Sellers list for African-American Romance! Right next to my favorite author, the late Mrs. Francis Ray! Also, the book is ranked number 88 in Multicultural Romance! How amazing is that huh?! It's gone down from when I originally checked earlier and I'm sure it will fluctuate on the list. But even if I'm only on the list for one day, it was awesome knowing I made it! Thank you all who have been buying the book! You guys are the ones making it possible! Well Happy Late Night Reading and Sweet Dreams!